Felt is material made from wool and magic, from wisps and clouds transformed to lightweight garments, caressing the skin and holding in warmth. It is an ancient craft, older than spun or woven threads. Yet it is still practiced daily, providing lovely and useful items for both modern and tribal cultures. 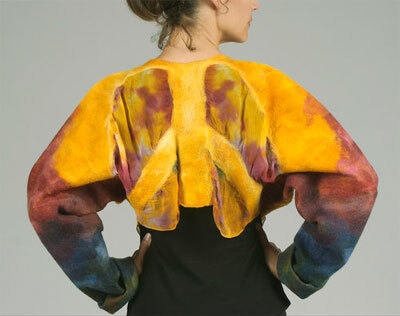 My garments and accessories are created from the finest wools and the sheerest silks, hand-dyed, hand-felted, hand-shaped. Many of my pieces are made from US family farm wool, naturally colored and chemical-free. Each is unique, evolving from disparate elements into a miraculous whole, through the magic of felting.